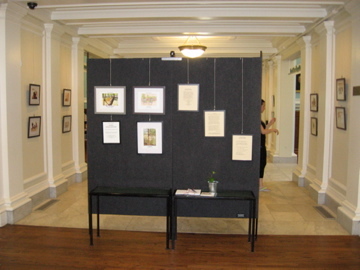 --2019 July exhibit Thomas Crane Public Library, Quincy. New theme on Fire. --2019 July exhibit Newton Free Library. Fire theme. --2019 September exhibit Winchester Public Library. New theme on Fire. Artweek Boston: "Stress Relief Through Art"
​ group in Stoughton with discussion. I exhibit framed work. I also share through personal presentations with prints or electronic projections. Wirebound, hangable, themed booklets "Art for Months" including 13 prints (8.5 x 10.5 inches) of my illustrations and captions are available. Booklets are $40.00, which includes USPS USA shipping.